Copicucullia cucullioides Barnes and Benjamin, 1923, Contrib. Nat. Hist. Lep. N. Am., 5(2):75. Diagnosis: This species is remarkable. 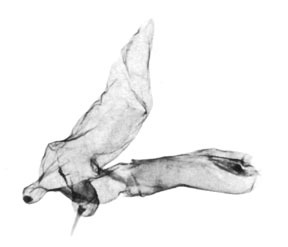 The tibial claw is almost entirely vestigial and the first sternite of the male abdomen bears both basal hair pencils and Stobe's glands. These structures are absent in all other members of this group, despite the obvious close relationship between cucullioides and eulepis. Additionally the ovipositor lobes of the female are highly modified. The lobes are large and armed with a few large, strong spines. These spines are also enlarged in eulepis, but in cucullioides the spines are larger and fewer in number. 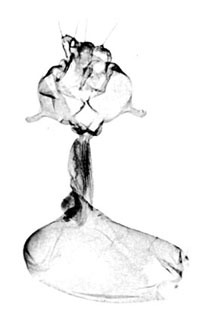 The apophyses posteriores of cucullioides are reduced in size and their apices rounded, but are unmodified in eulepis. 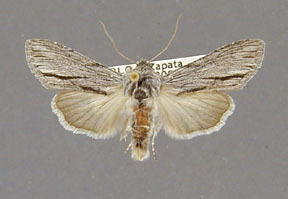 Cucullia cucullioides resembles eulepis superficially. 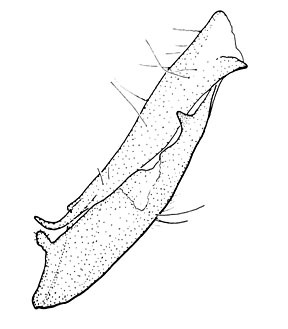 However cucullioides is smaller (an average 14 mm versus 16.5 mm from the base of the wing to the apex) than eulepis. 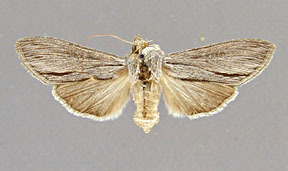 The forewing of cucullioides has a slightly striate appearance, eulepis a smooth one. 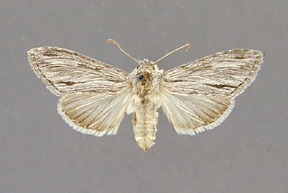 The hindwing is whiter at the base than in eulepis. Wing length from base to apex: mean = 13.58 mm., standard deviation = 0.90 mm., n = 10. 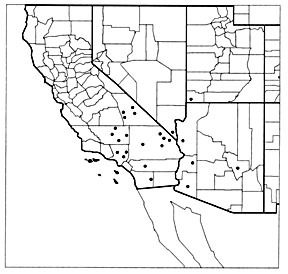 Distribution: Cucullia cucullioides is primarily a species of the Mohave desert region of California and Nevada, but extends into western and central Arizona and southwestern Utah. There is no discernable geographical variation. A bit of within population variability exists in the distinctness of the markings.